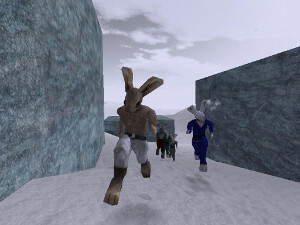 Lugaru is a 3D action game in which you are Turner, a rabbit who lives a series of adventures against other hostile rabbits and wolves. Turner is an expert in martial arts. Lugaru code and its contents are free. I write about this game because it has become one of my son&apos;s favorites. This is due to the enormous features that the game provides to edit levels, add new characters, create new stories and, in general, do whatever we want with it. But Roberto started asking me more things. In Lugaru, Turner faces all the dangers alone and my son wanted to have friends who help him to fight the forces of evil. At first, I didn&apos;t listen to him, but the insistence of a 5 year old kid is powerful, and finally, I started to study the game code to evaluate how much I could please him. Lugaru uses SDL, which surprised me, because I expected some more sophisticated engine, and its code isn&apos;t too debugged and has many parts that could be refactored, but it uses very descriptive names for variables and functions that allowed me to understand in a short time the internal structure of the game and how I could get what I wanted. After a week, you can check what I have achieved. It&apos;s quite nice for the little experience I have in this type of development. In my personal branch for Lugaru improvements you can see how I solved the problem and I also have made the video Lugaru: los amigos de Turner so you can watch the result. Surely, you can do these things with private games just as easily, don&apos;t you?